WSJ crew came out a nice documentary on European crisis – something to put in your archive. ECB’s liquidity injection: game changer, or not? 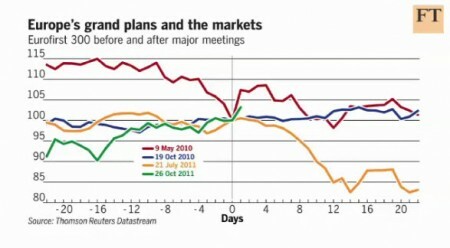 December 30, 2011 / 3 Comments on ECB’s liquidity injection: game changer, or not? According to WSJ, the ECB last week rushed out emergency support for the euro-zone banking system, laying out an unprecedented €489 billion at its first-ever three-year lending operation. The amount of money parked by euro-zone banks in the ECB’s 0.25% deposit facility surged to another new record of €452.03 billion Tuesday (Dec.27) , up from €411.81 billion over the Christmas break and well above the previous record high of €384 billion. News that euro-zone banks are parking more and more cash at the ECB’s low-yielding, but safe, deposit facilities adds to evidence that banks are more concerned with seeing out the year in safety than with putting it to work in the real economy or the euro-zone debt markets. Watch this interview of Bob Mundell – he thinks this is the game changer, a blockbuster event. The problem in Europe is that we’ve arrived at Europe’s own “Lehman-moment” when banks and institutions are wholly unwilling to lend money to anyone, anywhere. They are willing to draw down their lines of credit from the ECB, but they are re-depositing those borrowings back to the ECB itself. Initially we thought this reasonable. Initially we thought that the banks drew down their lines from the Central Bank and re-deposited them with the Bank awaiting investment elsewhere. We thought this normal. Now, however, we consider it disconcerting for it shows the utter sense of confusion and the even more utter sense of fear that has engulfed the banking system in Europe. Rather than viewing these new credit lines from the ECB as a source of funding for investment, the banks in Europe are viewing those ECB-created funds as a source of “fear capital” to be used should worst-come to-worse on the continent. Fear rather than optimism is driving the banking system. We fear then that worse is about to happen, for the very core of things banking and economic depend upon trust and trust is now wholly lacking in Europe. Why German bond yields are rising? 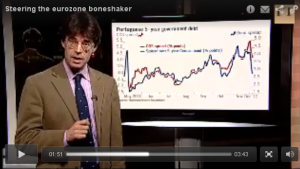 November 27, 2011 / 1 Comment on Why German bond yields are rising? Yields on German 10-year government bonds have risen 0.25 percentage point in the past week to 2.15% even as the euro-zone crisis has deepened. Until now, whenever the crisis has intensified, German yields have fallen and the yield premium for southern European bonds has risen. This shift is a sign the end-game is approaching. The difference is that buyers of U.S. and U.K. debt can be certain which country’s debt they are getting—and what currency it is denominated in. 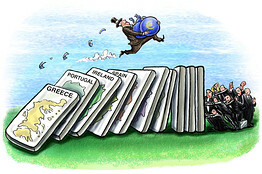 The euro-zone crisis is becoming binary. One possibility is greater integration, such as common bond issuance, which implies greater costs for Germany and fiscal dilution. The other is break-up, which implies costs for every country but which may favor short-dated German paper given the possibility of currency appreciation. Summit after summit – this seems to be what Europeans are best at. So are Europeans just delaying the inevitable? Europe’s Lehman moment. 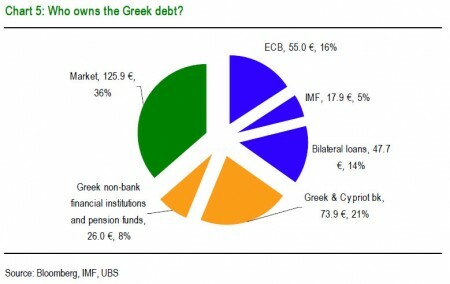 October 15, 2011 / 6 Comments on Who owns Greek debt? Greece has total debts of €346.4bn. About a third of this debt is in public hands (34.8% is attributable to the IMF, ECB and European governments), roughly another third is in Greek hands (28.8%, essentially for banks) with the remainder (36.4%) held by non-Greek private investors. So far, ECB has been using the wrong tools to fix a very urgent crisis. Bailout and debt monetization won’t solve the problem. Either way, it puts too much pressure on Euro. John Cochrane at U. of Chicago thinks the right approach is to have a bailout with precondition of debt restruction. If European governments want to bail out their banks, let them do so directly and openly—not via the subterfuge of country bailouts. Then they should face the music: How is it that two years after the great financial crisis, European banks make so-called systemically dangerous sovereign bets, earn nice yields, and then get bailed out again and again? European bank regulators should announce that sovereign debt is not risk-free, and that their banks need capital against sovereign loans, or they need to buy insurance (credit default swaps) against sovereign exposure. Will taking this step hurt bank profits? Well, yes. Sorry. That game, at taxpayer expense, is over. The big culprit in all of this is short-term debt. There would be no crises if governments had issued long-term debt to match long-term plans to repay that debt. If investors become gloomy about long-term debt, bond prices go down temporarily—but that’s it. A crisis happens when there is bad news and governments need to borrow new money to pay off old debts. Only in this way do guesses about a government’s solvency many years in the future translate to a crisis today. There are two lessons from this insight. First, given that the Europeans will not let governments default, they must insist on long-term financing of government debt. Debt and deficit limits will not be enough. Second, the way to handle a refinancing crisis is with a big forced swap of maturing short-term debt for long-term debt. This is what “default” or “restructuring” really means, and it is not the end of the world.